Christ the Healer Gospel Church in Riversdale is welcoming a new leader after its pastor and owner Max Solbrekken gifted the building to his close friend and the leader of the TORO Ministries, Reverend Terry Severson. Solbrekken, who has been leading the church for the last decade with help from his wife Donna, said he made the decision to gift the church because he knew Severson’s focus would be to grow the church by helping those living in the neighbourhood. He didn’t want to risk selling it to an organization that could potentially just be looking at making a profit. “I thought, I’ve got to turn this over to someone who can come and live (in the neighbourhood) because I could never find anyone that I could trust to really love the people,” he explained. “I didn’t want to pass it off to someone who would think, ‘OK, well, it’s not doing well. 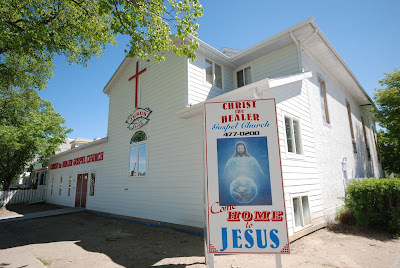 The 84-year-old Solbrekken is well known thanks to his work as what some call a faith healer — though he said he doesn’t like that term and would rather simply be known as a believer — but he says he’s not ready for retirement quite yet. Instead, he has plans to publish books and utilize YouTube and radio to expand the reach of his message. He also has an offer to preach on multiple TV stations including one in his parents’ home country of Norway.